ECS launches its latest next gen motherboard together with the all-new LIVA Pro Mini PC. Professional motherboard manufacturer, Elitegroup, worked together with Intel® to research and develop the new product, ECS H110S-2P. Its Mini-STX form factor extends high performance and flexibility to something as small as a hand. The New LIVA Pro mini PC is based on the H110S-2P providing our users best performance and trim choice. Mini-STX (147mm × 140mm) was defined by Intel® and ECS as the next generation form factor. It’s smaller than mini-ITX (147mm × 140mm) and reduced the layout space of the PCB by 29%. However, ECS H110S-2P and LIVA Pro still keep various design features and components on such a narrow and small space. You can choose any standard LGA115x CPU cooler to make the platform as cool as possible. 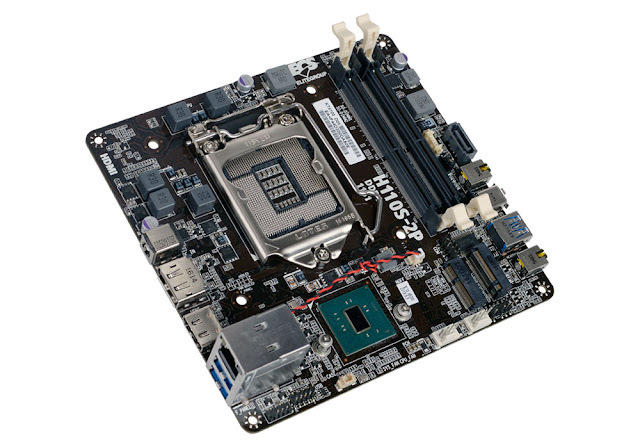 It supports 6th LGA1151 Processors without special regulations products, as well. Just choose a suitable chassis to be a builder of a One-Liter computer with our mini-STX motherboard design. ECS H110S-2P and LIVA Pro holds the philosophy of “Less is more” to make things easier. Both new products support Intel® LGA1151 TDP 65W CPU, flexibly and match with Intel® H110 chipset. Most important of all, the I/O is composed of SATA 6Gbps , USB 3.0 Type-C , GbE LAN , 802.11AC / BT 4.0 , Intel Dual-channel technology and RS232 Port. Dual display outputs are offered, in order to level up efficiency and productivity. ECS H110S-2P and LIVA Pro are better than ATX/M-ATX PC with lower power consumption and light volume case. Also, ECS H110S-2P and LIVA Pro are better than Intel NUC SoC PC with various I/O, flexible CPU choice and strong performance. So, perfect satisfaction is guaranteed for your business/education/IPC solution needs when using the ECS H110S-2P and LIVA Pro.